If you’ve ever been under to years old or over 70, you have no doubt played Bingo at some point. The classic version of Bingo is some good clean simple fun, but we though we could do better here at Silver Oak Casino. What could make Bingo any better? How about winning big cash prizes for scoring multiple lines or special patterns, and an exciting bonus round triggered by collected special Joker Bonus Balls? And this version of Bingo isn’t played at a retirement home pace. You can play a complete round of Silver Oak Casino Bonus Bingo (and win tons of cash) in under 10 seconds! If you’re ready to learn how to play this fast-paced, bonus packed version of Bingo, let’s get started! If you’ve ever played Bingo before, you will recognize the 4 Bingo cards on the screen. The numbers on these cards are all randomly generated. If you would like to change the numbers on the cards, simply hit the “Change Cards” button at the bottom of the screen and 4 new cards will be generated automatically. You’ll notice that under each card it says “Bet $0.05”. 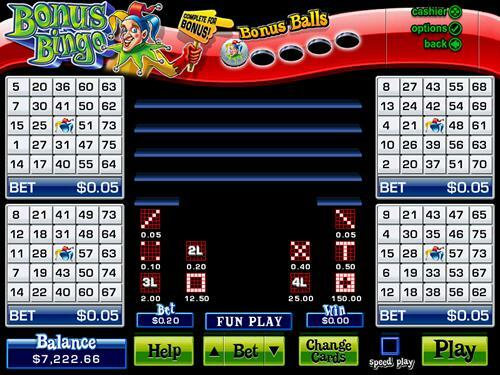 5 cents is the default bet for each card in Bonus Bingo. To change the bet per card, simply click on the up and down arrows around the “Bet” button at the bottom of the screen. Now that I have the bet per card I want, I’m ready to get this game of Bonus Bingo started. I won a total of $12 on a $4 bet, not bad! In the center of the screen you can see a list of every ball that was played in this round of Bonus Bingo. Also, you will notice that if money was won on a card, it will list how much was won underneath the card. For example, under the card on the lower left hand part of the screen you’ll see that it says “WIN $12”. That was a good card! Once you are finished looking at your winnings, you can start a new round by clicking on the Play button again. Be sure to check back soon for articles all about the Bonus Bingo Rules and even some Bonus Bingo Strategy that can help you win some extra money. If you are ready to give the game a try for yourself, you can download Bonus Bingo along with over 130 other free casino games by clicking on the Play Now button below.